Graphics card maker nVidia kicked off the SIGGRAPH exhibition this morning by releasing info on their brand new Quadro Plex. Think of it as the equivalent of rack-based storage for graphics. Aiming to strike a balance between high-end proprietary video systems and lower-end SLI work stations, the Quadro Plex operates can operate in nodes of two which can be clustered together for high performance graphics tasks. For nVidia, this is a logical extension of the Quadro graphics card they've been selling. The idea of scalable external graphics is probably an attractive one for professionals in a number of fields: nVidia toted out several of its partners, including Google Earth Chief Technologist Michael Jones, who used the app to show some fascinating pictures of Beirut before and after the recent air strikes. While the average consumer isn't going to have much use for these things (or, for that matter, be able to afford them since the low-end model should start around $17k), I'd certainly love one on a gaming rig. 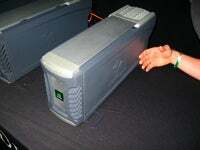 All you need is a machine that supports PCI Express; a repeater card plugs into your computer and a 2m cable (the height of Darth Vader, as nVidia General Manager Jeff Brown commented) is strung between the card and the Quadro Plex. Mac users shouldn't get excited quite yet. When asked about the support for the platform, Brown said "You'd have to ask Apple," elaborating that while they'd love to see the QuadroPlex working with a Power Mac, there's no Mac compatibility out of the gate.